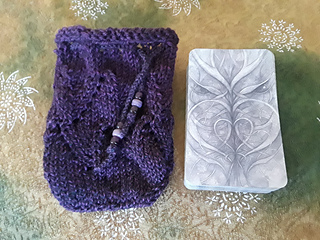 Keep Your Tarot Deck Cozy and Warm on a Cold Winter’s Night! Flamekeeper Tarot Bag by Joy Vernon. Hand knit in Knitting Fever Painted Sky yarn, in colors #225 Brandywide and #229 Jungle Juice, 100% SuperWash Wool, with glass crow beads. The graceful curl of a flickering candle flame flows around the entirety of this drawstring tarot pouch. This lacy pattern impresses without stress: it’s fancy but no-fuss. 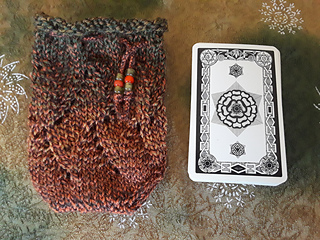 A fun rolled cuff top and a snazzy drawstring channel start off this knit tarot or gift bag easily enough. But as sophisticated as the flame chevron pattern looks, it flows smoothly, following a logical order. The curving rows of eyelets give you a quick peek into the bag to see what deck is inside. 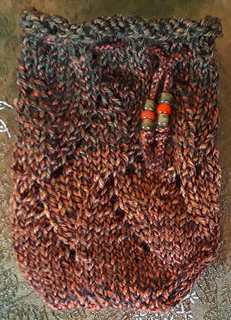 The top-down pattern is knit in the round on three double pointed needles. My signature decrease sequence creates a close-fitting, shapely bottom that perfectly fits your deck, holding it securely in place with a strong stitched seam. Although the finger cord drawstring is a cinch to make, it’s even faster if you opt to use a ribbon or purchased cord. Any way you close the deal, some dangling crow beads add a festive touch. 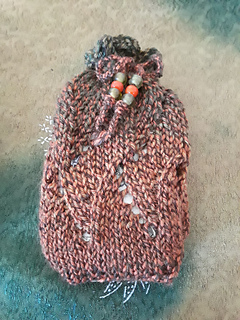 The bag is sized to fit a standard tarot deck. 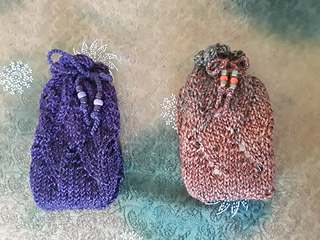 You can knit three bags and their drawstrings from a 100 gram ball of yarn, so give them as gifts or bust through your stash.